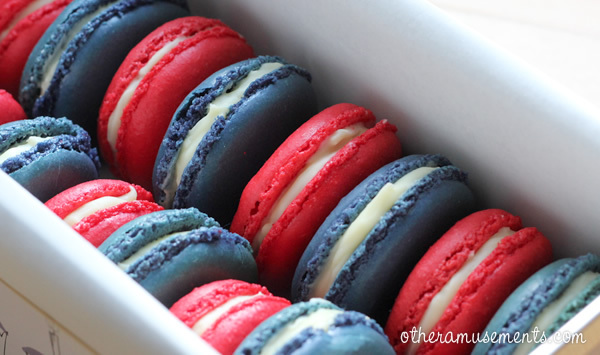 So, I decided to make red, white, and blue macarons for the occasion. I think Patriotic Macarons is a good title - they would work in the UK, USA, France, Norway, Russia, Iceland, Luxembourg, Australia ... you get the picture. I wasn't convinced I could make 'white' macarons. They are always a little bit yellow-y from the almonds, so I went with a white filling instead - white chocolate ganache. Plus ganache is super easy to make and very tasty. This is how they turned out. I was worried no-one would eat the blue ones, since blue food is meant to be really unappetising, but they all disappeared no problem. Here is the recipe for the ganache, you can use it to make truffles too.You need 5oz of white chocolate and 3oz of double cream. (I used a whole 150g bar of chocolate.) I think the ratio might be different for milk or dark chocolate, so this is just for white. All you do is warm up the cream in a pan until it just about simmering - then pour it over the chocolate and leave it for a minute or two. Mix it up well so there are no lumps left then leave it to cool. I popped mine in the fridge for half and hour. If you leave it longer it will get a bit more solid - which is not useful for filling macarons but you can roll it into balls and make delicious truffles. As a side note, making macarons tends to leave you with a lot of egg yolks. If you don't have anything to do with them right away, I read that it's best to cover them with a little water before you put them in the fridge to stop them from drying out. However, this time I used all the yolks and the left over cream from the ganache and made a pint of custard which I've put in the freezer. Next time we have apple pie or something, I think I will be mighty pleased that it's there waiting.